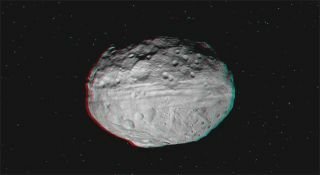 A 3-D video of the asteroid Vesta incorporates high-resolution images taken by NASA's Dawn spacecraft from July to August 2011. The images were obtained as Dawn approached Vesta and circled the giant asteroid during the mission's survey orbit phase. Movies in 3D may be all the rage in Hollywood these days, but a new 3D video of the giant asteroid Vesta is truly out of this world. The video, which is best viewed with red-blue glasses, lets viewers glide over the surface of the giant space rock, and features stunning up-close views of Vesta's bumpy ridges and pockmarked surface. NASA's $466-million Dawn spacecraft has been in orbit around Vesta since July 15. The 3D video was created by Ralf Jaumann, who is a member of the Dawn mission team at the German Aerospace Center. Jaumann made the film by stitching together high-resolution images that were taken by Dawn from July-to-August 2011. "If you want to know what it's like to explore a new world like Vesta, this new video gives everyone a chance to see it for themselves," Jaumann said in a statement. "Scientists are poring over these images to learn more about how the craters, hills, grooves and troughs we see were created." Viewers then fly over the asteroid with scenic close-ups of Vesta's battered surface, including three huge craters that are peculiarly linked at their rims. Mission scientists nicknamed these craters in Vesta's northern hemisphere the "Snowman" craters because of their distinct likeness to the wintery figure. This bird's-eye view of Vesta also includes a virtual tour of a massive mountain inside an expansive crater at the rock's south pole. The central peak stands a staggering 16 miles (25 kilometers) high, which is more than twice the height of Mount Everest. Since arriving at Vesta, Dawn has been beaming back the clearest views yet of the huge, battered space rock. The images featured in the film were obtained as the spacecraft approached the asteroid, and as the probe made its first orbit collecting science data. This orbit, which is known as the survey orbit, took the probe to an altitude of about 1,700 miles (2,700 km) above Vesta's surface. "Dawn's data thus far have revealed the rugged topography and complex textures of the surface of Vesta, as can be seen in this video," Carol Raymond, Dawn deputy principal investigator at NASA's Jet Propulsion Laboratory in Pasadena, Calif., said in a statement. "Soon, we'll add other pieces of the puzzle such as the chemical composition, interior structure, and geologic age to be able to write the history of this remnant protoplanet and its place in the early solar system." A set of three craters, nicknamed "Snowman," are seen in this image of the asteroid Vesta's northern hemisphere. This image was obtained by the framing camera on NASA's Dawn spacecraft on July 24, 2011, from a distance of about 3,200 miles (5,200 kilometers). Measuring 330 miles (530 km) across, Vesta is the second-most-massive object in the asteroid belt between Mars and Jupiter. Because of its size, many astronomers classify Vesta as a protoplanet, saying it would have continued to develop into a rocky planet like Earth or Mars if Jupiter's gravity had not wreaked havoc in the asteroid belt long ago. NASA's Dawn mission is the first prolonged visit to a large asteroid. The spacecraft was launched in September 2007 and has since traveled more than 1.7 billion miles (2.7 billion km). Dawn arrived at Vesta July 15 and will spend a year studying the giant rock and taking detailed photos of it from three different orbits. Then, the spacecraft will leave Vesta's orbit and travel to the asteroid Ceres, which is the largest body in the main asteroid belt. Ceres measures about 590 miles (950 km) across and is so large that it is considered to be a dwarf planet. Dawn is expected to arrive at Ceres in February 2015.